At first glance, this Entitled Parking photo doesn’t look too bad. Just one car straddling a parking spot line, and another plopped in what clearly is not a parking space. But look closer. 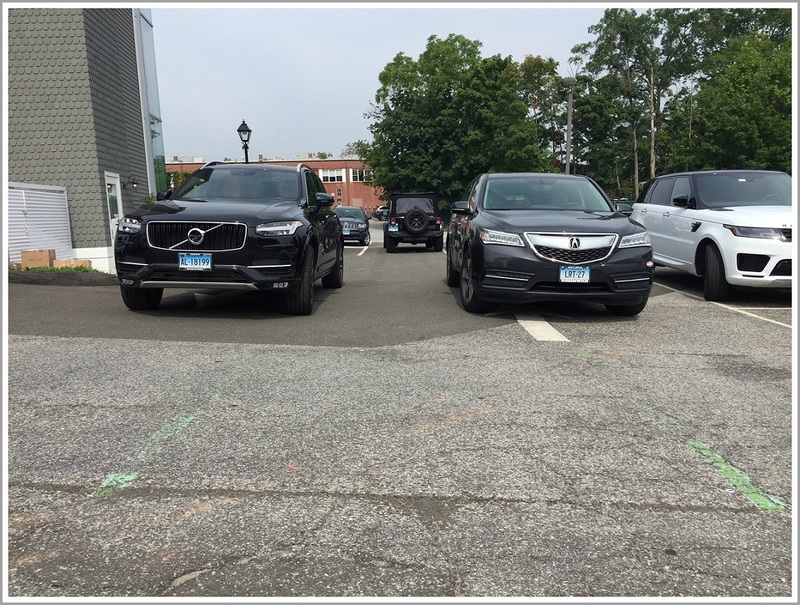 That’s not a fat parking line that the Acura is parked over. It’s a directional arrow, pointing one way into the lot behind Serena & Lily, in the Baldwin lot on Elm Street. And that Volvo is also smack over another arrow, pointing the way out. In other words, these 2 Very Important People completely block entry and exit into the lot. In order to get out or in, drivers had to go all the way to the back, near the fence, then circle around. Of course, there were several empty spots nearby. But at least the weather was nice. So these 2 guys (or gals) could enjoy the very brief walk to wherever they urgently needed to go. This entry was posted in Downtown, Transportation, Westport life and tagged Baldwin Parking Lot. Bookmark the permalink. These cars should be towed. It happens all over town……..disgraceful! And I agree that such cars should be ticketed and towed away. License plates are plain as day, can tickets be issued after they’ve left with the photo in evidence?